Hope Gallery is pleased to be hosting the opening reception for “Pinned & Sewtured” this Saturday. 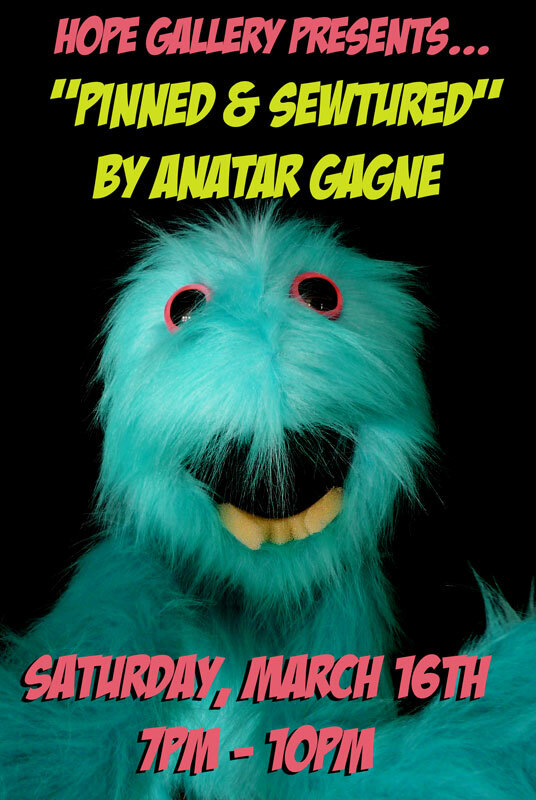 The show will feature over 30 hand made creations from puppeteer Anatar Gagne. We thought you might want to learn a little more about the artist and then come meet her in person this Saturday from 7-10 at Hope Gallery in New Haven. How did you get started making puppets? I’ve been collecting vintage henson muppet puppets since childhood. They didnt make all the characters back then so I decided to make one. I bought some felt and began playing around. I then found a vintage henson muppet pattern to use as a base- I didn’t even finish the mock up when I realized I should have started making puppets years ago. Have you had any formal training or did you pick it up yourself? My grandmother was a seamstress, my mother sews and my stepmother is a designer so i have been surrounded by sewing since birth. My sewing foundation was there, but making puppets has been completely self taught, full of many late nights looking at puppetry books, patterns, and lots of trial and error. My very first puppet was Lloyd. I had some pink fur left over from my Animal costume I had made a few years back. 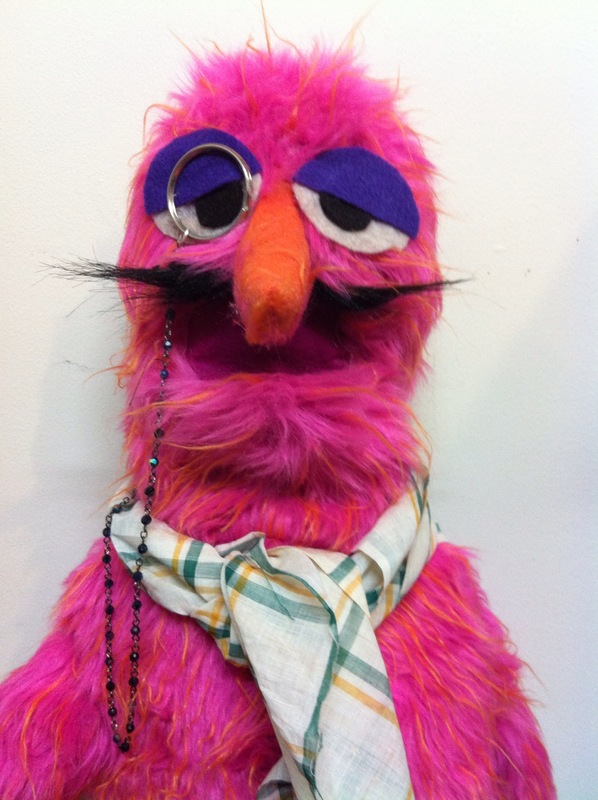 The monocle and ascot fit his personality: he loves his cream tea and masterpiece theather. And he cannot live without his significant other, Lydia. My biggest inspiration has been Jim Henson- it’s definately palpatable in my work. However, I do draw a lot of it from watching people, looking at their features, and gestures. A few of my puppets are very personal, stemming from an emotion, personal experience or someone who impacted my life. Some are inspired by pop culture and some just come from the dreamer within. How has it been working on “Pinned and Sewtured”? Its been an incredible journey. This project has really pushed me to learn how to work with different materials, to refine and transform skills, and I am very content how my vision has come to fruition. Can you tell us the back story on some of the characters? The “Unwanted Family” series is a collection of the worst possible family members. Aunt julie eats small children, so family gatherings are very stressful. Kids over 5 years old are safe but anything under that is a goner. The family has tried interventions but have amounted to nothing. She collects their shoes as trophies. Uncle joe used to be married to Aunt julie but he couldnt take her eating small children anymore so he tried commiting suicide by throwing himself in the dryer. He didnt realize he was a poly blend so now his fur just looks like a giant mess. He lives in a dumpster and is always wearing his disguise, hoping that Aunt Julie doesn’t recognize him. Ever. What is it about making puppets that you like so much? Everything! Puppets are magical, they give me the complete freedom to do, say, create any character imaginable. Its a world without limits. Not only do I get to write the story but I build the puppet, therefore binding the two- thats where the real magic is for me, seeing what I have on the page become completely three dimensional. We get so caught being adults that we forget about the simple things in life. Puppets just make me smile. What would you love to do in the future with your work? Write and produce more puppet shows, but my childhood dream is really to work with the Henson company. This entry was posted in Art, Interview and tagged anatar gagne, art, custom, exhibition, gallery, hope, pinned, puppets, sewtured, show. Bookmark the permalink.